The Panorama Factory creates panoramas from a set of overlapping digital images. You can add image hotspots, export to VR formats and create web pages that link your images into virtual tours. The m32 Edition supports multi-core processors. 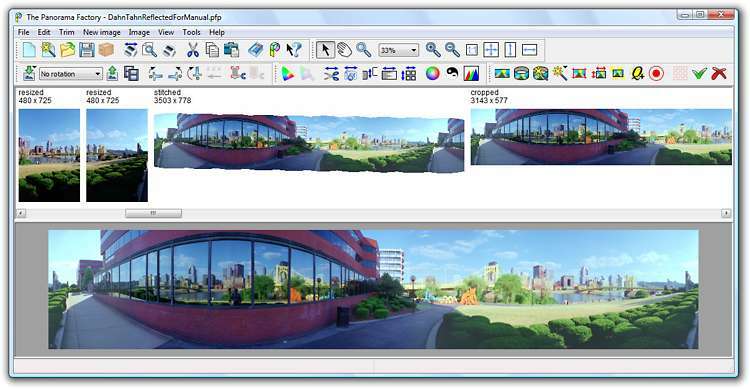 The Panorama Factory creates high-quality panoramas from a set of overlapping digital images. You can add image hotspots, export to VR formats and create web pages that link your images into virtual tours. The software also corrects for lens-induced distortions and creates either cylindrical or spherical image projections. Additional features include onscreen zoom, support for digital SLRs, correction for barrel distortion, correction for brightness falloff and interactive controls. The m32 Edition supports multi-core processors. The Panorama Factory creates images that rival those made by expensive rotational and swing-lens panoramic cameras. Not only can The Panorama Factory facilitate creation of immersive VR worlds, it also provides features for the fine-art panoramic photographer who wishes to work from ordinary 35mm images or images captured with a digital camera. The Panorama Factory supports JPG, BMP, PNG, TIFF image formats and QTVR, IVR and PTViewer virtual reality formats. The virtual tour features make it possible to add hotspots to panoramic images and to create and update web pages and thumbnail indexes. Hotspots are used to link panoramas together. For example, a set of panoramas showing rooms in a house can be linked together so that clicking on a doorway moves from one room to another. Users can automatically create web pages and thumbnail indexes when the panoramic images are saved. The web pages and thumbnail indexes are created from templates. Some predefined templates are supplied with The Panorama Factory, and users can create their own templates. The software optionally corrects for barrel distortion and for brightness falloff, two problems that are common to many digital cameras. These problems can be corrected automatically and, if necessary, the user can adjust the corrections interactively. Automatic image alignment and focal length detection can also be adjusted interactively. LivePIM LiveDoc Converter is a handy and powerful program that lets you convert Microsoft Word document to image files (DOC to JPEG, DOC TO JPG, DOC TO BMP, DOC TO PNG) easily. Professional photo tool to stylize contemporary images on photographs taken by traditional methods and analog methods. This software offers a solution to users who want to insert 0s into filenames to keep them properly aligned and in alphabetical/numerical order. This site does not contain serial number, crack, keygen The Panorama Factory m32 Edition serial number : serial number is the simplest type of crack. A serial number(cdkey,product key,etc) is register the program as you may already know. a crack or keygen may contain harmful software. If you cannot find the exact version you want, just give it a try. for more information read .nfo/.txt/.diz file include in zipped file.